For continuous measurement and control of in-process gases, our advanced range of durable gas analyzers and gas sensors provide accurate measurement with minimum maintenance. What is a Tunable Diode Laser analyzer (TDL analyzer)? Tunable diode laser analyzers are systems for measuring the concentration of specific species within a gas mixture using laser absorption spectrometry. Simply put, a laser beam, tuned to identify a particular gas species, passes through the gas to a detector. The presence of this gas in the stream causes light absorption and reduced signal intensity. The light collected at the detector is detected by a photodiode and analyzed to quantify the gas concentration. TDL analyzers are rapidly replacing other technologies in process plants because they offer increased productivity, capacity upgrades and higher safety. How can I reduce maintenance and installation costs with a TDL analyzer? Installing a TDL analyzer for in situ gas analysis allows you to eliminate the sample conditioning system that is required with standard extractive techniques. In addition, due to the one-flange, folded path concept showcased by METTLER TOLEDO's GPro 500 Gas Analyzer, you can further reduce the installation and maintenance costs related to typical TDL analyzer alignment. What gas species can be measured with a TDL analyzer? METTLER TOLEDO GPro 500 Gas Analyzers offer measurement of carbon monoxide (CO%), carbon dioxide (CO2%), hydrogen chloride (HCl), hydrogen sulfide (H2S), gaseous oxygen (O2) or moisture. We are continuously expanding our offering of parameters to support industry needs. What are some suitable applications for a TDL analyzer? TDL gas analyzers are used in a wide range of applications across a variety of industries. Installations are common in chemical industries, petrochemical refining, pharmaceutical manufacturing, and food and beverage production. In industries such as chlor-alkali, TDL analyzers can replace traditional measurement systems for moisture monitoring to prevent compression system corrosion. A GPro 500 with a filter probe adaption is optimal for combustion applications where high dust loads could typically obstruct measurement. This setup is particularly appropriate for fired heaters and boilers. 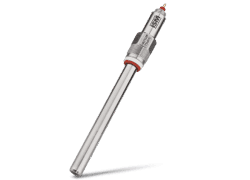 In inerting and blanketing applications, the use of a non-purge probe provides increased safety and reduces running costs. For in situ gas measurement in DN50 or 2" pipes when you have high or low velocities or where you wish to avoid flow restrictions, the GPro 500 Wafer Cell adaption provides stable measurement. What is an amperometric oxygen gas sensor? Amperometric, or polarographic oxygen sensors are sensors for measuring gaseous oxygen using an oxygen permeable membrane and an electrochemical anode/cathode assembly. These sensors are good for gas monitoring in applications such as nitrogen blanketing and off-gas monitoring. Amperometric gas-phase oxygen sensors provide fast measurements and are quick and easy to replace, calibrate and maintain. How often do I need to service an amperometric gas sensor? The inner body of an amperometric gas sensor requires occasional replacement. More frequently, the electrolyte in the sensor's membrane body will need replenished and the membrane body itself, replaced. Replacement/refilling times vary based on individual application conditions and knowing when to conduct these tasks is often down to the experience of operators. 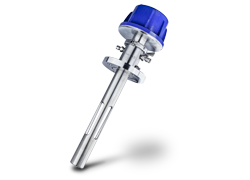 METTLER TOLEDO's amperometric gas sensors with Intelligent Sensor Management (ISM) technology offer diagnostic tools that show, in days remaining, when inner body and membrane body replacement or electrolyte refilling should be performed. These tools, such as the Dynamic Lifetime Indicator, help to ensure that you avoid any unplanned downtime in your monitoring and control processes. How often do I need to calibrate an amperometric gas sensor? Calibration intervals are difficult to calculate, but ISM technology will give you an estimate based on the conditions of the process the sensor is operating in. The Adaptive Calibration Timer (ACT) provides an accurate calculation for when you should plan to calibrate your gas sensor, meaning less unplanned downtime or process interruptions. Designed for in situ and extractive chemical processes, these TDL gas analyzers are easy to install and require almost no maintenance. In process-gas streams or tank applications, amperometric oxygen gas sensors provide reliable, real-time measurements without the need for gas sampling or conditioning. Safety, quality, productivity: that’s what’s most important to you. And that’s why our approach to designing analyzers and sensors is based around a simple challenge – how can the design, handling and maintenance of our products help you reach your goals? This led to us rethinking gas analytics and the development of a unique portfolio of gas instruments that offers you faster measurements, greater process availability and unequalled ease of use. Tunable diode laser gas analyzers, introduced in the 1990s, have seen rapid growth in industry over the past decade. This is due to their exceptional performance and reliability. Today, TDL spectroscopy continues to make technical advances, making this class of sensor the preferred choice by many chemical and petrochemical companies. In this free booklet we discuss the theory of absorption spectroscopy and how TDL analyzers are being employed in an increasing number of process and safety-critical applications. Measuring hydrogen chloride (HCl) gas in industrial applications can be very challenging, but is required by regulation in many countries due to its polluting effects. It often must be measured in industrial exhaust systems to ensure levels are within required regulatory limits. For that reason, nearly all stacks and scrubbers where HCl is present are equipped with monitoring devices. Probe-style TDL gas analyzers provide a reliable and cost-effective alternative to measuring HCl, compared to traditional methods. Tunable diode laser (TDL) spectroscopy is rapidly becoming the gas analysis technology of choice in industrial processes. But sometimes users find that conditions at the measurement location can limit their use. METTLER TOLEDO has been rethinking gas analytics and has developed the GPro 500 series, a versatile platform that allows you to place a TDL wherever it matters in your process, whatever the location.